Btw. another strong playing chess program for CP/M is MYCHESS. The latest version is 2.3(b). It comes with a configuration program (MYCONFIG.COM). Unfortunately the preconfigured MYCHESS.COM uses already very different ESC sequences to show block graphics I guess, see below. Btw. : Using VirtualKaypro (Java based) is a pain. You have to know that it runs only with country setting "English (USA)", not with a german setting, because the class function for converting the time to a string presumes only US date/time format. Also, you can't use a directory name containing blanks. And finally, preloading a "blank" virtual floppy disk with files using the java program archive "format.jar" is also chaotic, because there is no description for the parameters you have to use. The "raw" format is NOT a real binary sector-by-sector raw format, instead, it presumes to have a header, too. 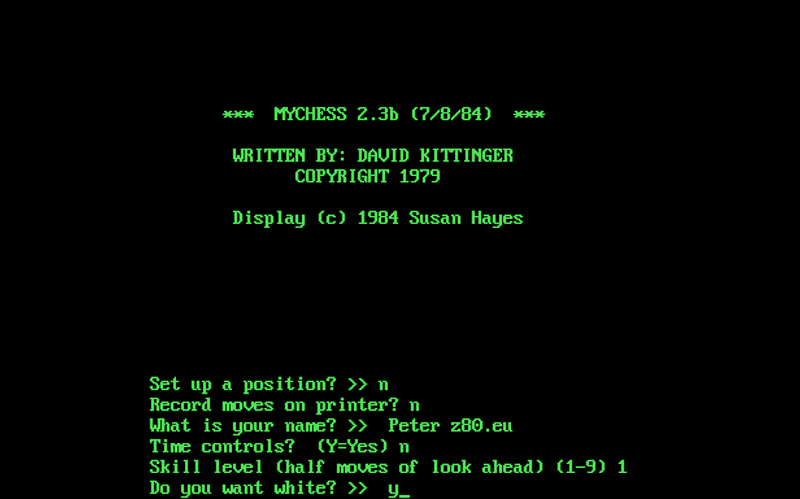 Related link points to a ZIP file with all CP/M files of MYCHESS 2.3b. 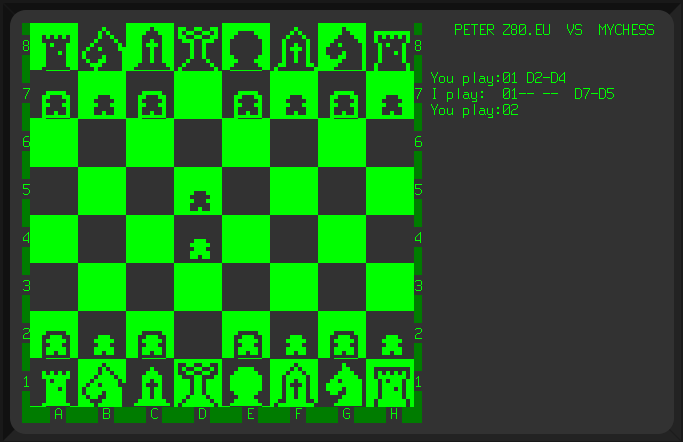 Well, usually chess programs must have a beautiful user interface to be played, as well as playing chess very well (so not only "Minimax" algorithm, but also some openings). Looking back to these old days of CP/M computers, screen graphics were rare and properitary programmed. Usually the screen output was characters only. 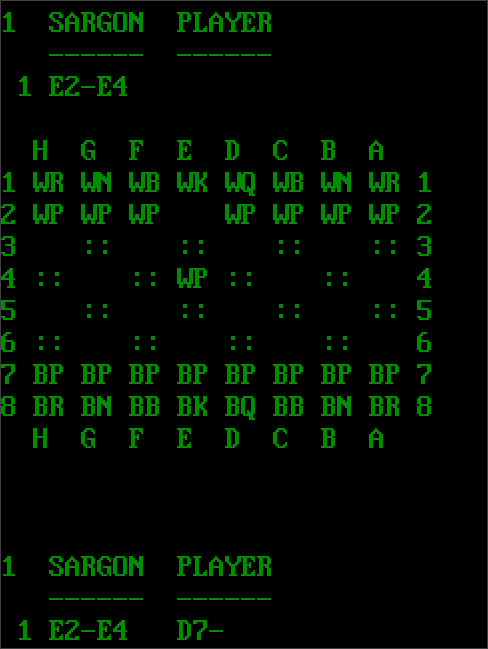 Sargon is a well known, famous chess program for vintage computers. 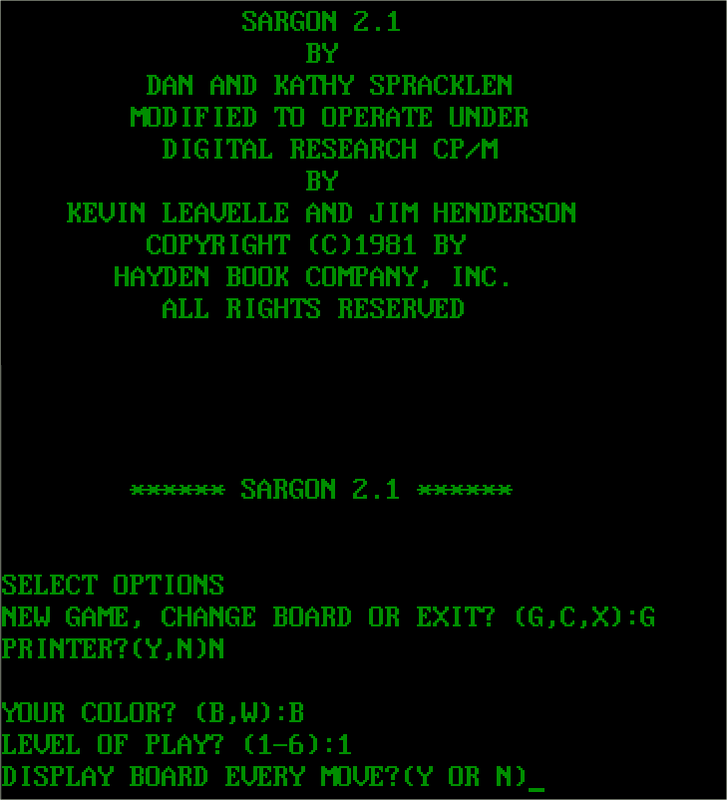 The first version was SARGON for Z80, and runs (adapted already) on *any* CP/M 2.2 computer. The screen output is ... unique (not beautiful at all). 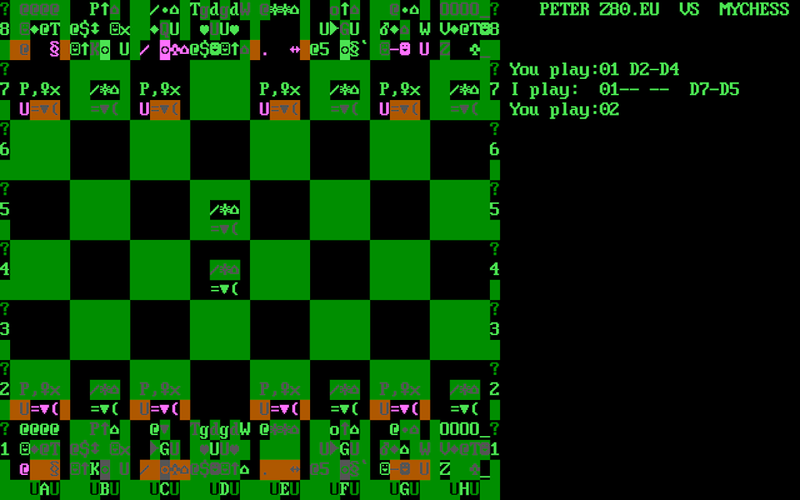 But it is playing chess very well, I lost a few games even with Level 1. Related link offers the CP/M binaries. It was taken from >Udo Munks download page< (the files from the disk image there can be extracted with cpmtools, disk format is 'ibm-3740', use 'cpmls' and 'cpmcp'). 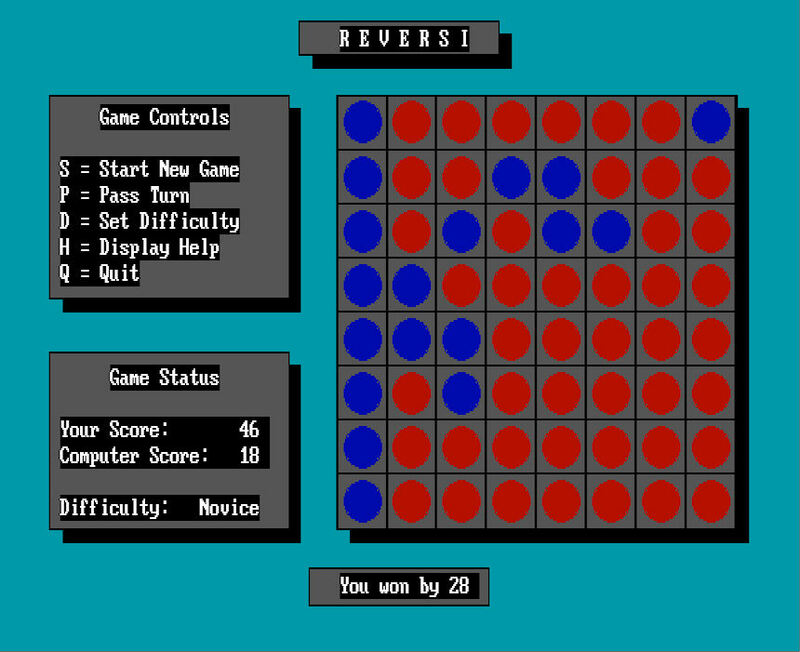 Almost every Windows 3.x user knows REVERSI aka OTHELLO as a 16-Bit Windows game. 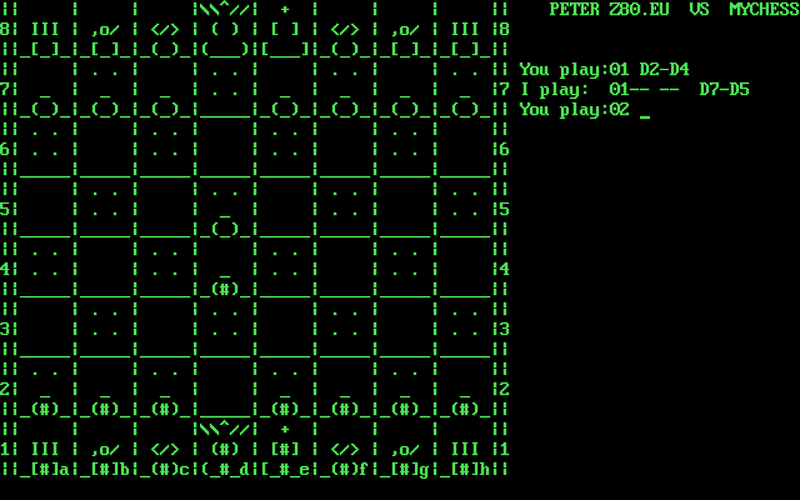 But Microsoft published the same game also as a QBASIC game. QBASIC was part of MS-DOS 5.0, development of MS-DOS 5.0 reached beta level in 1990. Just judge yourself about the game playing strength of that program and start QBASIC from DOS 5 again (e.g. with the help of DOSBOX, which is running even with Windows 10). Or compile it with >QBASIC64< (which compiles it to a native Windows program). Related link points to the source code ZIPped. It seems that something is very different with the Pentium 200 Board (in a 430FX mainboard). I exchanged the ASUS P55TP4 with a SOYO SY-5EAS5 board, and plugged in an AMD K6-2/400AFR CPU. Surprisingly VGACOPY is running again (reading a 360KB floppy disk in a 360KB floppy disk drive), but HD-COPY 2.0a is still not working. This is indeed a surprise, because my first theory about it was, a faster CPU makes more problems than a slower CPU. But the AMD K6-2/400 is definitely faster than a Intel Pentium 200 (no MMX). Btw. : CCS64 v3.92 (running with Windows 98) is working very well with that AMD K6-2 CPU, fast enough to emulate a C64 with 100% speed and excellent compatibility.